We ship on Monday, Tuesday and Wednesday using UPS Overnight and 2nd Day Air. All orders received after noon on Wednesday will ship on the following Monday. How do you ship your ice cream? We ship our super-premium ice cream in Styrofoam cooler with blocks of dry ice. We require a minimum of four pints but can ship as many above that as you would like. We ship with enough dry ice to last until the evening of your order’s scheduled delivery. Click here for more information. No but we cannot be held accountable for packages left on your front porch. We will ship with enough dry ice to keep your ice cream frozen until the evening of your order’s scheduled delivery, but we haven’t yet installed our theft deterrent systems to keep sticky fingers off of your cooler. Can you ship ice cream cakes and pies? Shipping costs depend on the destination of your ice cream and how fast you need it to get there. Leopold’s Ice Cream guarantees that your ice cream will arrive frozen. If your ice cream arrives melted, we will reship your ice cream on the next regular business day or issue you a 100% refund. We will make every effort to meet your requested delivery date, but weather and delivery problems beyond our control may cause delays. While we guarantee a safe delivery, and we will do our best to meet your requested delivery date, we DO NOT and CAN NOT guarantee the date and time of delivery. Customers are responsible for checking that all shipping information is correct before submitting an order as well as in their order confirmation email. Once a package has been shipped, the address cannot be altered. There are no returns, modifications, or cancellations allowed on any order once it has shipped. Please notify recipient in advance to expect delivery of a perishable item. Please confirm that the recipient will be returning home on the evening of delivery or will be in the office on the day of the delivery. Please confirm that the delivery address is correct, as UPS will not forward packages. Any order processed with an incorrect shipping address being given to us will incur a $15 service fee, as this is the charge that UPS levees against the shipper when trying to correct an address for delivery. 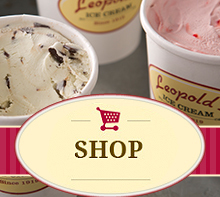 Because ice cream is perishable, Leopold’s Ice Cream cannot accept returns or exchanges. Any shipping, return or refund concerns should be directed to orders@leopoldsicecream.com; we take all shipping, return and refund concerns very seriously and will respond appropriately and quickly. Our customers have always been our number one priority and will continue to be our first priority in the future. Security is provided concerning credit card information, names, addresses, e-mail addresses and any other personal information that visitors may provide within the transactional portions of our website. Although “guaranteed security” does not exist either on or off the Internet, we safeguard our visitors’ personally identifiable information by using industry standard practices. Our Secure Sockets Layer (SSL) software is the industry standard and among the best software available today for secure commerce transactions. It encrypts all of your personal information, including credit card number, name, and address, so that it cannot be read over the internet. Any security concerns should be directed to info@leopoldsicecream.com; we take all security concerns very seriously and will respond appropriately and quickly. Our customers have always been our number one priority and will continue to be our first priority in the future. We at Leopold’s Ice Cream, have the utmost respect for our customers’ privacy. In no way will we violate that respect. We will not release any information gathered about our customers. Any information that we gather from our customers will be compiled anonymously and used solely for our statistical purposes. The statistical information we gather from our customers will be used to help us enhance the shopping experience for our customers. Any privacy concerns should be directed to info@leopoldsicecream.com; we take all privacy concerns very seriously and will respond appropriately and quickly. Our customers have always been our number one priority and will continue to be our first priority in the future.